Snow is falling on the medieval rooftops of Modena as the city stirs back to life after the Christmas and New Year festivities. The metal shutters of cafes rattle open, as loudly as express trains, while the aroma of fresh coffee drifts along the cold air in the winding streets near the Piazza Grande. Unsurprisingly, most of this city’s best and most celebrated restaurants remain closed for the holidays, doors firmly shut after the last tortellini-stuffed customer waddled home in the wee small hours of January 1, 2008. Not even a sausage stirs at Hosteria Giusti, reckoned to be the oldest salumeria in the world (it opened in 1605, and I don’t mean five minutes past four) which serves lunch at a quartet of scrubbed wooden tables in a backroom each weekday. There is nothing doing at Osteria Francescana, the contemporary Michelin two star restaurant where Frank Bruni, the feared critic from the New York Times, praised the ‘five ages and five textures of parmesan’ preparation an autumn or so ago. The entrance is also firmly chiuso at the more traditional Fini where, for nearly 100 years, Modenese society has come to eat dishes such as tagliata di manzo all'aceto balsamico, or perhaps the house speciality of gamberi e mele in salsa rossi. This was Pavarotti’s favourite restaurant, where he would often have supper with Enzo Ferrari, another famous son of the city, and drink his favourite local wine, Lambrusco. The Novanis run a small but stylish fish restaurant called Hostaria del Mare in a quiet backstreet near the centre of Modena. The 20-seat room has a grey slate floor and is decorated in a pleasingly spare way, with bare brickwork, good linens and interesting artworks. The luxury is present but understated and the warm welcome – a nice smile, a good seat, a basket with three different types of fresh bread – underlines the fact that the Hostaria is a family affair. This is further accentuated by the cheerful and generous assaggi which is brought unbidden; a crunchy, king prawn, partnered by a big, creamy scallop, sitting on top of a pile of herby lentils. You know, there are several London restaurants I could mention who would have added a sprig of parsley and sent this little baby out as a main course. 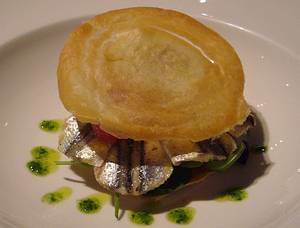 The menu is short but interesting, packed with fish and seafood preparations such as bavette ai ricci di mare, zupetta di faro e cavolo nero with calamari, and pasta with a mixed shellfish sauce. There are also a few meat dishes for the unbelievers, including duck breast roasted with ginger and szechuan pepper, and a ragu of fallow deer. For antipasta, we have a sandwich-type assembly, featuring discs of crisp, thin local bread. The bottom disc is painted with friggione, a thick paste of slow cooked onions and lard, typical of the region in many ways, not least because it sounds awful but tastes delicious. On top of this, a layer of sprightly mixed salad, then some fat, silvery, marinated anchovies. Finally, a scattering of concasse tomatoes and then the top disc of bread. Primi is a seafood lasagnetta; two silky squares of pasta draped over and under an unusual filling of turbot and prawns, with the rather opulent addition of a brace of langoustine tails on top. The firm, fresh seafood and the bouncy pasta is dressed with a light béchamel sauce that heightens rather than overwhelms. A scattering of steamed broccoli florets adds a fresh, verdant touch. This is a dish that boasts lots of good flavours and textures with the soft white flesh of the turbot nudging up to the crunchy prawns, and the whole thing is beautifully cooked. After this, baccala arrostito con zuppetta di ceci e olio al rosmarino; roast baccala with crisped slices of parma ham on top, served in a chickpea sauce scented with rosemary and dressed with a few drops of olive oil. Again, the fish component has been cooked to the precise perfect point, although perhaps the cod could have done with a little more rinsing. To be fair, I put this down to the holidays plus the rush to re-open, and do not judge harshly. For although there is a slight tendency to over-sauce, the chef here convinces with his talent and flair in every other way, particularly how he makes the most of the limited seasonal ingredients available to him in the bleak midwinter. Also, he earns bonus points for not splashing balsamic vinegar over everything to please the tourists. No, that’s just not the way at the Hostaria del Mare. Even the restaurant’s puddings, so often an afterthought, show care and attention to detail. A sugar dusted cake is packed with a home made nut paste and served with macerated fresh fruit, providing a bravura and fragrant end to an excellent lunch. A quick note about the wine; from a careful, capsule list, the Castelluccio Lunaria 2005 (18 euros), is a sauvignon blanc with a light floral bouquet and a nice, fresh finish; a perfect match for this meal. In short, what a blast of aria fresca to find a restaurant like this in an area famous for its rich, succulent meat-based dishes, and how brave of the Novanis to forge on with their fresh, piscine vision. 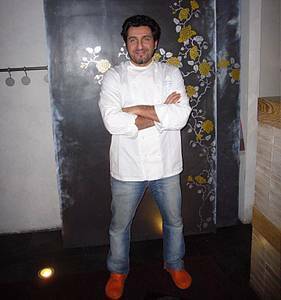 Yes, the food of Emilia-Romagna is justly famous and its thick, golden pasta is without peer. Tagliatelle with ragu and the occasional bollito misto are fabulous, but it can leave diners feeling swamped. However when you need something lighter, brighter and downright zinc-ier, this is the place to come. 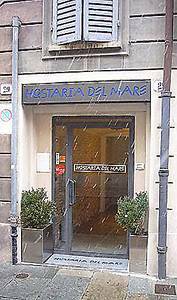 Hostaria Del Mare, Via Castelmaraldo, 29, Zona Pomposa, Modena Centro. Tel: 059 238561. Meal for two, 150 euros.